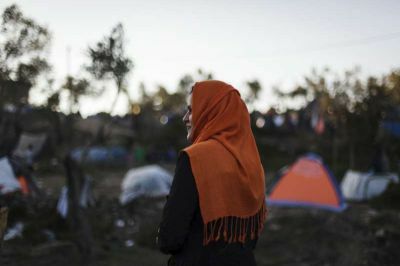 LESVOS, Greece, UNHCR – Amena Yusufi, a 21-year-old woman from Afghanistan, stepped out of a medical tent on Lesvos’ busy Moria reception and registration centre and called for the next patient. A mother and her baby stepped forward. Amena listened patiently as the mother explained the baby’s stomach had been upset for days. She then relayed that information to a volunteer doctor. Amena Yusufi is neither a doctor nor a nurse. But at Moria, where more than 2,000 refugees are registered daily, the four languages she speaks in addition to her native Pashto are critical to communication between her fellow refugees and migrants and the aid workers and volunteers who come from all across the world to help them. Amena came to Lesvos with her mother, father, two cousins and five younger siblings. The family fled Afghanistan after her father decided they were no longer safe. He had fought in Kunduz, a northern city that fell to the insurgents in September. He feared the group would target the family if they stayed in Kabul. More than 820,300 refugees have arrived in Europe by sea since January, including 135,000 in October alone, according to figures collected by the UNHCR. About 57 per cent have passed through Lesvos, located just 6 miles from the Turkish coast. The island continues to receive 3,300 new refugees and migrants daily. Afghans make up a growing portion of the Lesvos arrivals at 32 per cent. They trail only Syrians, who make up 56 per cent, and far outnumber Iraqis, who comprise six per cent. Amena says her family arrived in Turkey by plane one month ago and attempted to cross the Aegean Sea to Lesvos four times. Each family member paid just over £650 for a seat in a flimsy rubber dinghy crammed with 45 people, all Afghans. The first three times, their boat sank and Turkish authorities rescued them, and on the fourth attempt they finally made it. She described the journey as “very scary.” “We lost everything on the boat – our money, phones, papers, everything,” Amena recounted. At Moria, for three nights they slept in a plastic tent in an olive grove outside the official camp walls along with hundreds of other people. Together, Moria and Kara Tepe, the island’s other reception centre, have capacity for only 2,800, though according to police there were a daily average of 8,800 refugees on the island in November and 9,000 in October. UNHCR has called for increased reception capacities on Lesvos as well as the acceleration of winterisation efforts as temperatures drop. In Greece, reception and registration of refugees and migrants are the responsibility of the Greek government. The Lesvos municipality and local police run the two main centres, Moria and Kara Tepe, with the help and support of UNHCR and various international NGOs and volunteer aid groups. UNHCR recently set up 250 family refugee housing units, including 62 in Moria. Another 114 such houses remain to be installed at Moria, Kara Tepe, and the sites of UNHCR partner organizations around the island. She wants to live in a place where women – particularly educated women – are treated more equally. The family left Lesvos on a ferryboat to Athens on Tuesday evening. Their final destination is unknown.